This is a photograph from the HMRS collection which is baffling their experts. Its reference is AAM435. An unknown location - but from the Foulkes Roberts collection. These photos were taken round Denbigh in 1923-61. So maybe North Wales? The locomotive and carriages are approaching Denbigh with a train of 6-wheeled carriages from Ruthin. I would suggest it must have been taken around 1921 by Foulkes Roberts. Following on from John Stockton-Wood's comments regarding "approaching Denbigh" I attach a section of map which seems to match the photograph. If I am correct then the photographer would have been standing opposite the present day caravan site. As indicated this photograph was taken near Denbigh. Having checked the relevant 2 chain plan, I believe that the photograph of a train from Ruthin to Denbigh was taken looking south east towards Ruthin near the half mile post from zero at Denbigh station. The bridge shown in the background is no. 6. Wynne Park Cottages can be seen to the left of the bridge. There was formerly an occupation bridge (no. 5) between the photographer and the bridge which had been demolished by the time the photograph was taken. I'm sure Huw Edwards is correct. The photographer seems to have been standing in the cemetery shown at the left edge of the map provided by Peter Whitby in his note 2 above. For comparison there is a photograph taken later in the day, showing a bunker-first 2-4-2T on a similar train, in W.G. Rear's Corwen to Rhyl (Foxline, 1993), p66 upper. This one seems to have been taken from the next bridge to the west (No 4?) which carried Ystrad Road over the line, but the backgrounds look identical. As John Stockton-Wood suggests, the photographer was probably Foulkes-Roberts, but which one? There were at least two railway enthusiasts of that name - D.S. Foulkes-Roberts and, probably earlier, A.D. Foulkes-Roberts. One or the other, or both, took some fine shots of trains in the Denbigh area. Further to my previous post, may I make the following additional comments? 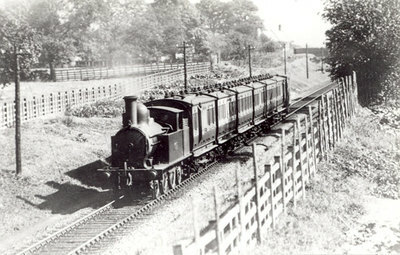 There was no house near the A525 bridge when the railway existed as shown in the photograph. The line north west of the A525 bridge quickly became an embankment. No such embankment is shown in the photograph. The former occupation bridge between the photographer and the bridge shown in the photograph was demolished between 1883 (the date of the 2-chain plan) and 1898 (the date of 2nd edition Ordnance Survey plan). Large numbers of railway occupation bridges have been demolished in recent decades as they have became obsolete. The above shows that they were being demolished as early as the 1880s and 1890s. Harry Jack is quite correct. Three of the four photographs on pages 66 and 67 of W,G, Rear's 1993 book, Corwen to Rhyl, were taken from Bridge no. 4 carrying Ystrad Road. Could somebody confirm the exact make-up of this train please? Undoubtedly a Chester District Set with an additional third D.297 compared with the 1906 schedule. Thank you Philip - just what I hoped. Would make an excellent model. Your comment will appear here – Email to the Webb Master please.